the island nation had had enough of it. In 1987, New Zealand finally buried its forest service, one of its most enduring symbols of bureaucratic bungling; an unlikely alliance of environmentalists, economists and reformist politicians played the role of executioners. 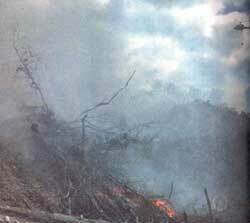 Out of the ashes emerged the department of conservation ( d o c ), charged solely with protecting native forests. Of the 5.2 million hectares (ha) it now safeguards, not one can be laid bare any longer for production purposes; there are, however, exceptions for cultural purposes (making Maori canoes, for instance). The revolutionary concept that publicly-owned native forests could be managed by a department that would never cut down a tree was too radical for some to contemplate. For decades, environmentalists had battled the 65-year-old forest service over its policy of destroying native forests and replacing them with the exotic radiata pine trees, native to California. By the early '80s, economists and politicians too had become disillusioned with the financial performance of government departments which undertook 20 per cent of the country's investment but generated only 12 per cent of the national income. The forest service was no exception; in its last years, it had been running at a loss. In retrospect, the decision to dismantle it is seen as the right one, except by those foresters adversely affected by the changes or those who continue to believe in the service's philosophy. That philosophy -- the belief in 'conservation management or multiple-use forestry' -- has spread across the globe from the time its foundations were laid down in the us just before the turn of the century. It resulted from a fundamental split between idealists such as the San Francisco ( us)- based Sierra Club founder John Muir, and others like philosopher-forester-publicist Gifford Pinchot. The latter insisted that renewable resources should be used, not "locked up". Says New Zealand conservationist Guy Salmon of the Wellington-based Maruia Society, "This philosophical division has strongly marked the conservation movements of most Western-influenced countries. It is Pinchot's essentially utilitarian notions of conservation that dominated the thinking of resource departmental managers in New Zealand, reaching their highest practical expression in the sustained management for the industry of serried ranks of radiata pine." Skewed priorities In its heyday, the forest service had administered 270,000 ha of pine plantations and 5.2 million ha of indigenous forests. The reasons behind setting up the forest service in 1919 were valid: native forests were being mowed down. When the Maoris arrived in New Zealand about 1,000 years ago, 80 per cent of the country was covered with forests; the figure had dropped to 50 per cent during the beginning of European occupation in 1840, and today it stands at around 23 per cent. During the depression (1930s), thousands of hectares of pine forests were planted around central North Island. Soon, exotic forestry became the service's main preoccupation. Even so, it did not significantly change its policy about native forests. New Zealand's leading conservation organisation, the Wellington-based Royal Forest and Bird Protection Society, first called for a separation of production from protection forests in 1937. Wrote the group's founder Val Sanderson: "No official forester is needed for reserves. Not another tree should be felled. Nature is the best forester." That plea, however, fell on deaf ears. Not until 1975 did the forest service introduce an indigenous forestry policy which rejected clear-felling and conversion of forests for farming or exotic forestry. However, for 10 years afterwards, officials managed to convince successive ministers of forestry that they should be able to ignore this policy in key areas of the country. During that time, 27,000 ha of native forests disappeared under the axe. The forest service could have carried on as a commercial business without including native forests within its boundaries. Around 95 per cent of the total timber production from state forests was from plantation-grown exotic species. Also, the service would have been surrounded by less controversy if it had relinquished control of native forests. Towards the end of the service's reign, much of the minister's time and that of senior head office staff was taken up in responding to the nationwide furore over mismanagement of native forests.  act as total resource managers who had the capacity to balance all human needs and use of the forests in accordance with their own elite training, judgement and wisdom. Kevin Smith, conservation director of the Royal Forest and Bird Protection Society, believes forest service staff were indoctrinated into a particular way of thinking. "Forestry training was punctuated by practical work in forestry camps usually located in small timber towns. In these towns, the prevailing anti-conservation sentiments were imprinted on the impressionable young trainee foresters at a time when their lifelong value systems were being developed. It comes as no surprise then that foresters' attitudes towards conservation ranged from indifference to aggressive hostility," says Smith. But by the mid-'70s, public opinion on environmental issues was making itself felt. In a country of just 3.5 million people, 341,000 signed a petition demanding that "publicly-owned native forests should be placed in the hands of an organisation that has a clear and undivided responsibility to protect them." In 1976, the government responded by amending the 1919 Forests Act to introduce the notion of "balanced use". The forest service was charged with the administration of "all state forest land to ensure the balanced use of such land, having regard to the production of timber or other forest produce, the protection of the land and vegetation, water and soil management, the protection of indigenous flora and fauna and recreational, educational, historical, cultural, scenic, aesthetic, amenity and scientific purposes". However, this "something for everyone" policy had deep flaws. Invariably, timber production took precedence over other needs and the principle of multiple-use gave foresters almost total freedom to decide how a forest would be managed. Take the example of Pureora forest in central North Island, one of the remaining habitats of the endangered songbird, the kokako. The magnificent 1,000-year-old trees the bird relied on for nesting and food were being logged despite the wildlife service's (another government department) advice. In 1978, protesters camped high up in the trees to stop further logging, forcing the forest service to capitulate. But Pureora was just one forest; elsewhere, less high-profile areas continued with the same management regime as before. More than 90 per cent of all wildlife service recommendations for state forest lands -- over a 15-year period -- were rejected by the forest service. Discontent of environmentalists was just one of the elements that led to the downfall of the forest service. By the early '80s, New Zealand's economy was in bad shape: high inflation, an adverse balance of payments and rising unemployment convinced many that economic restructuring was vital to restoring the country's fortunes. The forest service provided a classic example of economic inefficiency; in the guise of regional development and to soak up unemployment, forests were planted in remote areas far from markets and on poor soils. "Commercial analyses were never carried out for pine planting investments, since resource managers had their own inscrutable reasons for what they were doing," says Guy Salmon. "The result was a very poor rate of return on the taxpayers' investment in production forestry, while much of the state's resource available for harvesting in future was poorly located on steep, remote land," he adds. The forest service was caught in a cleftstick; though its chiefs pleaded lack of culpability (after all, they said, politicians made the decisions, not bureaucrats), someone had to take the rap. Kevin Smith says one option -- to reform the department -- was considered but rejected. "The department's power base was so formidable it could successfully resist treasury and ministerial control over its operations and the wishes of the public were treated with open contempt. By 1985, politicians of the newly elected Labour government, treasury economists and environmentalists were of the same mind: production forestry should be separated from the management of conservation lands," recalls Smith. On March 31, 1987, the axe finally fell on the forest service. Its remnants were reassembled as the forestry corporation (which managed non-native production forests, mostly pine plantations). The corporation was established as a state-owned enterprise ( soe ). Its primary objective was to operate as a successful business, which it did until 1990, overseeing the sale of cutting rights to private bidders. Once it had achieved this, the soe was disbanded and the ministry of forestry was created to act as a policy advisor. Still to be resolved was the question of which agency should be allocated production native forests. It was easy for North Island: all production had ceased in publicly-owned native forests, which were taken over by the department of conservation. South Island presented a problem; there, large numbers of workers were employed in the native forestry industry. In exchange for the creation of 160,000 ha of reserves, environmentalists agreed that a small quantity of state native forests could be used for sustained yield production. It would be a simplification to imply that the restructuring has solved all problems related to native forests. Of New Zealand's 6.2 million ha of native forests, around one million ha is on loosely controlled private land. Nevertheless, the largest forestry companies have recently signed a forest accord, agreeing not to log native forests. The future of native forests is clear: they will be cut only in order to produce high-value products. Says Kevin Smith: "The restructuring changed the face of forestry in New Zealand. Through corporatisation and the subsequent sale of forestry licenses, the government has all but removed itself from any direct involvement in commercial forestry. New exotic plantings are now mainly targeted at marginal farmland or reverting scrubland on land of easier terrain near export ports." The environmental gains, he contends, have been "enormous", with New Zealand achieving far more in rainforest conservation than other countries. There remains the question of environmental controls over the 1.3 million ha of plantation forests. Critics have charged that a form of "environmental apartheid" is at work in New Zealand's forests: strict safeguards have been placed over native, but not over plantation forests. For example, companies may clear-fell pine forests without taking into account erosion or natural water courses, may use pesticides freely and may not replant trees. Most conservation groups have accepted the companies' practices. In return for the companies' pledge to stop logging native forests, the greens have agreed to promote radiata as sustainable. "Through the forest accord, we now offer almost total protection to our remaining natural forest. The only reason we can afford to do that is because we've taken up wood farming in an intensely productive form," says Ken Shirley, the executive director of the Forest Owners Association. But over the recent years, the debate over forests has shifted. Where the major global issue in the forestry sector was once exclusively that of tropical rainforests, now the question of forest quality -- whether in the tropic's rainforests or in temperate plantations -- has acquired preeminence. The forest industry's argument -- "We plant more trees than we cut so we must be good for the environment" -- does not wash with Greenpeace New Zealand's Grant Rosoman, who in 1995 wrote a critique of plantations, The Plantation Effect . In this, he claimed the trees planted by the industry were more susceptible to pests and diseases, and were inhospitable to birds. In fact, the industry has attempted to accommodate such criticisms with the formulation of a set of principles for commercial plantation forest management, recently signed with conservation groups. However, Rosoman does not believe these go far enough, the text of the principles being punctuated with qualifiers such as "where practicable" or "where appropriate". Greenpeace favours creating plantations from a mix of native and introduced trees. But it also realises that by the time such a forest reaches maturity (in about 100 years'), it might well be considered a 'natural' forest, and future environmentalists will lobby to preserve it -- a huge disincentive for foresters to invest in such forestry. Whatever the present arguments over plantation forests, they pale into insignificance beside the uproar over logging of native forests. For that reason, the overwhelming majority of New Zealanders have wholeheartedly welcomed the reforms of the last decade.